Summertime in Raleigh is here and protecting yourself from the sun's ultraviolet rays is 'ultra' important! Summertime in Raleigh is here and protecting yourself from the sun’s ultraviolet rays is ‘ultra’ important! It’s that time of year again here in Raleigh. Whether you’re traveling to Jordan Lake or making a trek to the beach, the sun’s rays are out in full force. While celebrating pool openings and the beginning of summer, it’s important to protect you and your family from the potential harmful effects of the sun. While sunburn is a common condition with many remedies, there are plenty of misunderstandings about how to prevent sunburn and what actually causes it. We’ll also go over a few conditions that might seem like sunburn, but could be more serious if left untreated. It’s true that most sunburns cause only a day or two of discomfort, but some exposures can lead to sun poisoning or even skin cancer, and it might be necessary to see a doctor. Remember to always contact your local FastMed Urgent Care if you have questions or experience a sun-related illness that does not heal quickly. Most people correlate sunburn with high heat or temperature, but sunburn is in fact caused by radiation from the sun’s ultraviolet (UV) rays. In fact, this is why sunburn exposure is at its worst in the hours before noon. The sun’s UV rays are at their strongest early in the day, even if the temperature is still relatively low. This is also why you can be sunburned even on a cloudy or cool day. Ultraviolet radiation penetrates most surfaces, and that’s why an extra layer of protection is ultra important. 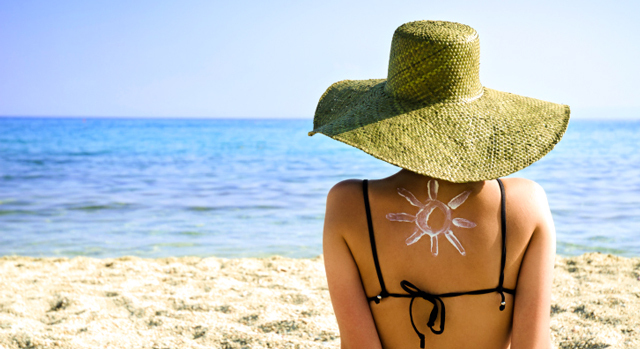 70% of Americans have reported sunburn in the last year. Naturally, those who spend time outside will be more at risk, but sunburn can be particularly bad on a sandy beach or near water because the sun is reflected back towards an individual who is already absorbing rays directly. Also, urban areas like Downtown Raleigh or North Hills that have large buildings, windows, and reflective surfaces can put you at risk for sunburn even if the sun’s radiation isn’t as high. The time it takes for a sunburn to occur can vary depending on the sun’s intensity and your skin type. It can take an hour or as few as ten minutes to be burned, so always have sunscreen when you might be exposed. Also, certain medications might make you more sensitive to sunlight. Is sunscreen all I need to stay safe? Other than very thick surfaces such as a building, the best practical protection from the sun’s harmful radiation is, of course, sunblock or sunscreen. However, sunscreen must be used properly. First, many people do not know that sunscreen will go bad or expire, often within a year or two. Always check the expiration date on your sunscreen. Follow the directions on your sunscreen bottle; particular brands might be waterproof, but some are not, and different brands might last for different amounts of time or require reapplication sooner. It can take up to 30 minutes before sunscreen is fully absorbed and effective, so always apply before going outside. If you’re extra-sensitive, consider also wearing a hat and clothing that covers your skin. According to the American Academy of Dermatology, an SPF of 30 or higher that provides broad-spectrum coverage against both UVA and UVB light is sufficient. The FDA recommends a broad-spectrum sunscreen that has an SPF of 15+. Although SPFs of 90 and above are sold, most medical practitioners believe that anything over SPF 30 is essentially a marketing gimmick. It is more important to correctly apply your sunscreen than to purchase the highest SPF. Lotions, sprays, solids, and sticks — which type works best? Most sunscreens are equally effective. Select the type that works the best for you and your lifestyle. If you’re active, you may like a waterproof spray. If you have dry skin, you might want a lotion with moisturizing properties. You’ll be more likely to use what you like, so simply go with your favorite, or ask your local FastMed for suggestions. How do I know if I have sunburn? This one is simple: your skin will hurt. Redness will usually present itself within an hour or two after a sunburn, and your skill will experience dryness and discomfort. A feeling of “heat” coming off your skin is also common the day or two after a sunburn. Blistering and itching will occur with particularly severe sunburns. While most sunburn will resolve within a day or so, if your pain is severe or does not recede, you should consider visiting a doctor. If headache, severe blistering, confusion, nausea, or dizziness occur, contact a doctor or medical service immediately, and always dial 911 if the event is life threatening. Sun poisoning is an allergic contact reaction to light, which causes a rash. Severe sunburns or sunburns that appear more like a rash than a burn might be sun poisoning. Exposure to heat may also cause heat stroke — an emergency condition in which the body loses its ability to control its temperature due to overheating. Also, be sure to mention to your doctor if you have any other serious illnesses or take any medications, as these might affect both your sun-related illness and treatment.